- "When it comes to using the stage to mythologize its own unique stories, is there any city that can claim more success than Chicago?" 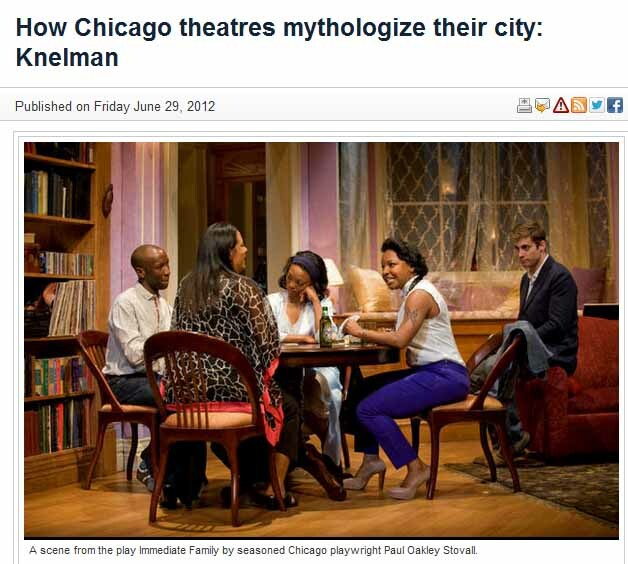 asks Toronto Star reviewer Martin Knelman, who waxes on about Eastland, Clybourne Park and Immediate Family. - Victory Gardens has announced their line-up for this summer&apos;s Ignition play festival. They&apos;ve chosen Seven Spots on the Sun by Martín Zimmerman; The Shotgun Message by A. Rey Pamatmat; Samsara by Lauren Yee; Appropriate by Branden Jacobs-Jenkins and The Curious Walk of the Salamander by Kirsten Greenidge. They&apos;ve also announced that their ensemble member Marcus Gardley will become a playwright-in-residence, who is working on an original play entitled Chicago is Burning. The festival runs July 29 through August 12 and has been expanded to two weeks because they&apos;d like to "offer increased time and attention to the work of this incredible group of artists and to offer more opportunity for them to engage with each other and with our city," said Director of New Play Development Jackson Scott. - Tony Adler on Will Eno&apos;s Oh, the Humanity! (and Other Exclamations) at the Gift Theatre: "If this is gimmickry, it&apos;s the highest caliber stuff."